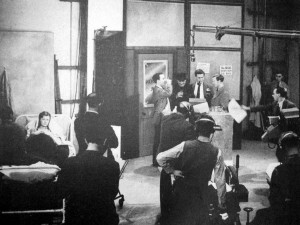 Barry later recalled how his 1946 dramatisation of The Silence of the Sea acted “as a spur, which led on to the six most exciting years that I have ever had, being allowed to write and direct, write and direct.”11 His script was chosen as a practice exercise prior to television’s resumption and then as the main evening programme on the night the service reopened.12 Its sympathetic portrait of a young German soldier billeted on a resentful French family was a brave choice given that hostilities with Germany had ended barely a year earlier. Recognising the limitation imposed on the visualisation of the drama by the archaic equipment, Barry made prominent use of sound, with the interior monologue of Kenneth More as the German soldier and various sound effects played into the live performance. Barry produced two more war plays in 1946, both drawn from radio scripts: They Flew Through Sand, a fast-paced action story set in North Africa, and Adventure Story, which portrayed a young couple returning from the war and struggling to adapt to the banalities of peacetime life.13 Written by Charles Terrot, with whom Barry went on to have a productive creative partnership, Adventure Story was a complex production which stretched Barry’s talents. As he had done before the war, Barry improvised the numerous settings required within the tiny studio. With the use of shadows and small items of scenery (and, in one instance, stage hands throwing water), he employed the power of suggestion to provide the numerous locations that could not have been built in the studio. Sound effects, models and back projection were used to give what Barry called “a depth and vitality to a tiny setting”.14 The play was a success and was reproduced several times. Back at the BBC, Barry found better fortune with The Passionate Pilgrim (1949), his own adaptation of Charles Terrot’s novel Miss Nightingale’s Ladies.19 A form of historical documentary based on the true story of one of Florence Nightingale’s nurses in the Crimea, the play was lauded by the Daily Telegraph as “A triumphant production”, and by C A Lejeune, as “beautifully acted throughout, and produced by Michael Barry with courage, tenderness and a real sense of the medium as a nascent art”.20 Barry’s restaging of the play in 1953 was broadcast two days before the Queen’s coronation, for which sales of television sets rocketed, and so was many viewers’ first experience of television drama. 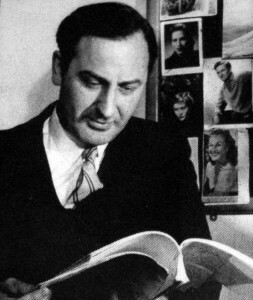 In the summer of 1950 Barry received the offer of a job in American television with CBS, but despite the prospect of a substantially higher salary, he declined, happy with the level of support and creative freedom at the BBC.31 He was excited by projects such as Shout Aloud Salvation (1951), which proved to be amongst his most successful productions.32 Adapting the manuscript of Charles Terrot’s sprawling historical novel about the early days of the Salvation Army, Barry reduced the story to focus on two young women despatched to introduce the Salvation Army into a bleak northern town. It was another large-scale production, with 50 characters, a riot staged in the studio, a real Salvation Army band and brief film sequences shot. An opening sequence used narration over a montage of background sounds and both still and moving images, indicating the bricolage approach employed by Barry, as he applied whichever techniques from radio and film best established his setting with the modest resources at his disposal. As Barry drafted Shout Aloud Salvation, the BBC advertised the new posts of Head of Documentary and Assistant Head of Drama, Television. Perhaps surprisingly, Barry applied for the former, as the latter was an unknown quantity at that time. However, he was called for an interview for the Drama post, and although Barry insisted the position was unsuitable, Director of Television George Barnes said Barry’s acceptance was important to television, and assured him that he would have a free hand, with Val Gielgud, Head of Drama over both radio and television, soon to return to his preferred province in radio. Talked around, Barry suggested “we try it for six months”.36 He was to stay ten years. He was appointed in May 1951 and radio and television formally separated in April 1952, with Barry duly receiving the Head of Television Drama title. Barry aimed to replace “dead wood” with new producers from film and theatre.41 New talents included Rudolph Cartier and Don Taylor, who went on to produce the type of vital work that Barry wanted to see. Cartier did much to expand television’s scope, with large-scale stories, but was only able to do so with the staunch support of Barry, who shared and encouraged his aims. Innovative producers, rapidly advancing technology and increased resources greatly improved production standards over Barry’s decade in charge. Plays were the primary form of drama for Barry, although he presided over the introduction of numerous popular series and serials, such as Dixon of Dock Green (1955-76), The Grove Family (1954-57) and Quatermass. As Don Taylor recalled, “under Michael Barry, the emphasis had been very clearly upon the production of television plays. The rest was a sideline, popular audience stuff, but not what the department was for. Michael Barry was a man of the theatre, and his values were the values of that milieu and that age”.53 His drama policy was occasionally criticised, as The Stage and Television Today reported, for “living in the theatrical past”, as “being out of touch with the present-day idiom of TV thought” and as “presenting plays with no appeal to modern minds”.54 The criticism reflected his perceived lack of a popular touch and, despite his championing of new television writing, his department’s continued scheduling of theatrical or classically “worthy” play series such as the unpopular Television World Theatre (1957-58). The arrival of ITV in 1955, with its more populist programming, highlighted the gulf between BBC programming and the public’s taste, and the Corporation was slow to respond to its success. Just two months later the Guild of Television Producers and Directors (the forerunner of BAFTA) recognised Barry’s achievements, giving him the Desmond David Award for services to television.56 Under Barry’s leadership, the Television Drama Department had expanded to the point that it produced over 220 hours of drama in 1961.57 As The Times argued, it was a period of “drive, organization and artistic skill”.58 Innovative drama programming such as the play “cycles” of Iain MacCormick, the serialisation of Shakespeare’s history plays as An Age of Kings (1960),59 and the immensely popular detective series Maigret (1960-63) all originated under Barry. Away from television, in 1965 Barry was appointed literary adviser to provincial theatres by the Arts Council, of whose drama panel he had been a member, to promote new and neglected plays. In 1967 he briefly returned to theatre directing. He later became Professor of Drama for California’s Stanford University, before returning to Britain in 1972 to become the Principal of the London Academy of Music and Dramatic Art. He finally retired in 1978. He completed a memoir of his time as a television producer, entitled From the Palace to the Grove, which was published posthumously in 1992. Michael Barry died in 1988 at the age of 78. In the time since he left his Head of Drama post it has become common for lazy critics to dismiss the BBC’s drama output under Barry as staid and stage-bound, particularly in comparison to the more populist fare of his self-aggrandising successor, Sydney Newman. Whilst Barry’s theatrical background was certainly reflected in his drama policy, this is an unfair simplification. Barry did much to encourage new television writing, to support ambitious producers in telling bold stories, and to improve the technical quality of the department’s output. In doing this Barry provided the firm foundations upon which Newman and his successors were able to build and further expand the scope and popularity of the medium. It is therefore a mistake to downplay Barry’s successes and ignore his contribution to the development of television drama, without which it would have remained in the nursery for much longer. NB. Prior to The Wars of the Roses Barry also directed productions he produced, as the two roles were routinely combined under the producer title at the BBC until around 1963. There are two exceptions, Martine and Twilight of a Warrior, which had separate directors, as noted below. *There is some doubt about this production. The Times’s television listing for the day of transmission states it is Smoky Cell. The Radio Times lists an entirely different play, also produced by Barry, called Whistling in the Dark. However, the former seems more likely both because Smoky Cell was definitely performed three days later, fitting the usual pattern of two performances, and because, being published on the transmission date, The Times seems likely to have the most up to date information on the schedule. Intriguingly, Barry’s memoir, which lists his productions up to 1951 (albeit with some errors), has no production for this date at all, with only one performance of Smoky Cell in 1938. We welcome further information to clarify the details of this broadcast. **It is not clear if this second performance occurred. Barry includes it in a list of his productions in his memoir (although, as above, this does include some errors) and it is listed in the Radio Times. However, it is not included in the television schedule for the day published in The Times, which, as noted above, could be expected to be the most up to date published listing. Originally posted: 11 January 2010. 20 November 2013: substantial new material added in the main text and endnotes; new list of credits added; minor corrections to existing text and endnotes. 4 January 2014: added For the Children credit and accompanying note.